Volunteers are vital to an election season - from organizations recruiting supporters for their candidate, to groups registering citizens to vote, to the men, women and youth who get involved with canvassing and volunteering on voting day. Need to coordinate volunteers fast without the hassle of "reply-all" emails, copious spreadsheets and last minute phone calls? 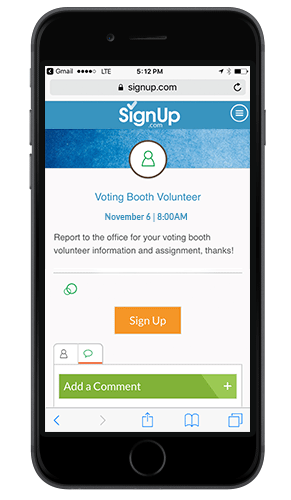 SignUp.com's free, online SignUps and volunteer calendars take the stress out of an already stressful election season and help your group and campaign do more with less! 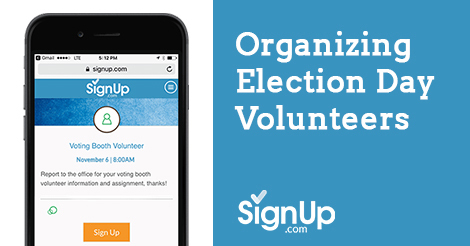 Organizers can register a free account here and build their volunteer SignUps in minutes. Include what you need volunteers to do or bring and use automated features like the Auto-Shift Scheduler to create repeating and recurring spots for each day or week you need volunteers. Volunteers can sign up 24/7 from the convenience of their computer or mobile device! eCalendar syncing and automated confirmation and reminder emails help keep everyone on track, too! Organizing an Election Day potluck or party? Free, online SignUps are perfect for coordinating guests and food too, read more.